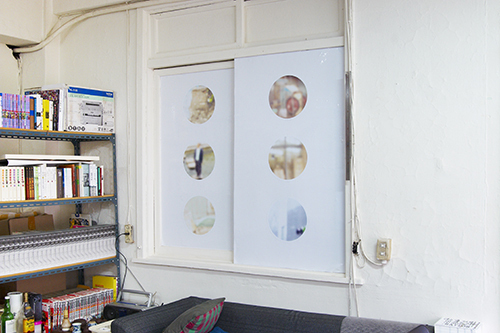 Sylbee Kim, Eunu Lee and Nicolas Pelzer's collaboratory curatorial project Guts and Cooperation enters Euljiro, a historical manufacturing business area, which went through drastic developmental changes over past years. 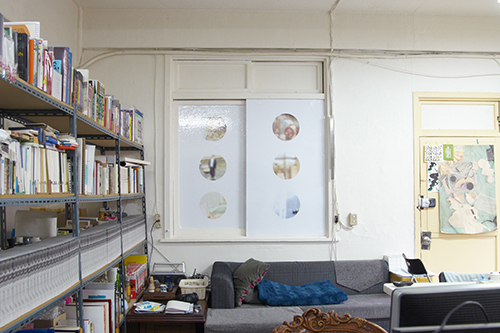 Graphic desinger duo Eunjoo Hong and Hyungjae Kim's studio situates in a run down building in Euljiro 3ga, in midst of pending gentrification process. Since 2011 it functioned as a site of making that rather represents younger creative generation who settle in search for inexpensive working space, at the same time becoming a place of exchange among these subjects. Currently in Euljiro coexist indurial hardware shops, dominant conglomeratess as well as more hidden independent workers in creative labor. Actively perceiving the given contexts, Kim, Lee, and Pelzer work with the designers at their studio, reflecting the experience of collaboration into the artistic results. Sylbee Kim perceives the spatial limitation considering its functionality as continuously working studio and transmit the understanding through a silent music video. 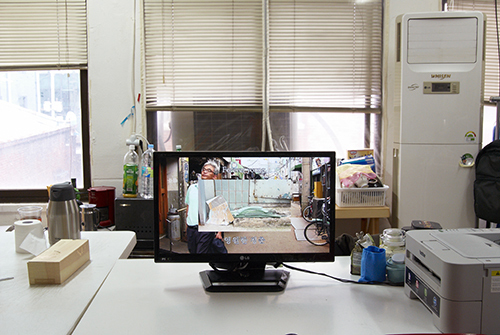 The work is played on a monior on desk, as if it were a part of the studio's already exsiting equipment. Everyone blames her is the 3rd chapter from Banned Songs: Così fan tutte, a series of silent music videos where protagonists and scenes from Mozart's eponymous opera is restructured as tableau of different contemporary socio-political issues, as if depicted from a future view. The lyric is suggested only through the karaoke subtitle, chapter 3 focusing on the complex status of Euljiro, with scenes shot arount the studio. 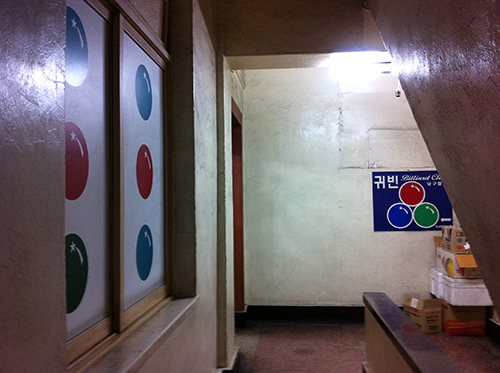 The presentation is connected to Kim's solo exhibition at spcae O'NewWall in October 2013. Honoured Guests is a digital collage of objects extracted from the shootings of Euljiro, creatively rearranged by Eunjoo Hong and Hyungjae Kim. The sheet is attached on the niche that used to be a window towards outside corridor, which is now covered only tracing its structure. Incongruently echoing the billiard salon's ad sign downstairs, it reflects the unpredictable prospect of the building, expanded by the visual elements from exterior world. 김실비, 이은우, 니콜라스 펠처의 공동 기획 전시 «근성과 협동» 은 을지로3가 비개발 구역의 낡고 오래된 빌딩에 위치한 그래픽 디자이너 홍은주 김형재 스튜디오의 장소특정적인 맥락에 적극적으로 개입한다. 스튜디오는 2011년 3월 오픈한 이래 디자이너 듀오의 작업 및 생활의 보조공간이자, 다양한 장르에서 활동하는 시각예술 창작자들의 교류공간으로서 활발히 역할해왔다. 을지로는 도시개발사적으로 다양한 변동과 진통을 겪었으며, 현재 인테리어 내장재 상점과 각종 산업 자재 및 장비 상가가 밀집되어 있다. 이러한 기본 맥락과 역사적 배경에 반응하여 미술가 3인은 조각, 설치, 평면 및 영상 신작을 전시한다. 김실비는 디자인 스튜디오가 전시 기간동안 여전히 작업 공간으로 역할해야하는 제한적인 여건을 영상언어에 대한 실험으로 치환한다. 음향을 삭제한 영상은 작업대 위에 놓인 기존의 모니터로 위장하여 설치된다. 영상 신작 <다들 그녀 탓을 하지>는 모차르트의 오페라 <코지 판 투테>로부터 인물과 장면을 차용한 <금지곡들: 여자란 다 그래> 연작의 제3장에 해당하며, 10월 스페이스 오뉴월의 개인전과 연계하여 공개된다. 존재한 적이 없는 가상의 금지곡을 위한 뮤직비디오로, 가사는 노래방 자막으로 제공된다. 화면과 가사는 전시 장소 주변 정체된 변화 선상에 놓인 을지로의 복합적인 환경을 담으며 동시대의 문제상황들을 미래 시점에서 돌아보기를 시도한다. 한편 <귀빈들>은 영상에서 추출한 을지로의 다양한 오브제들을 홍은주 김형재와의 협업으로 재배열한 평면 작업이다. 복도로 난 창을 막은 벽감에 설치되어 아래층에서 영업중인 당구장의 표식와 엇비슷한 호응관계에 놓인다. 건물의 불투명한 운명과 내부의 생계는 막힌 창에 접착한 외부 사물의 조합을 통해 확장되고 환기된다.